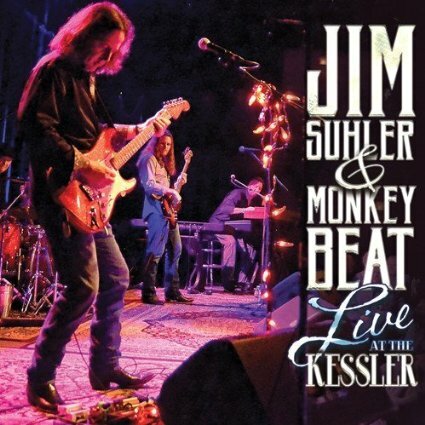 I just received the newest release, Live at the Kessler, from Jim Suhler and Monkey Beat and it's really fun. Opening with I Declare, Suhler gets the crowd warmed up on lead vocal with excellent piano support from Shawn Phares, Chris Alexander on bass and Beau Chadwell on drums. Suhler has a great voice and great tone. On swampy, Across the Brazos, Chadwell's snappy drum beat and accordion like key work by Phares add extra flavor. Rock n' Roller, Doin' The Best I Can, is a hard driver with Suhler showing his super slide technique. This is a great cranker and Suhler presses on with strong support by Phares on keys. Excellent! Tijuana Bible has a real nice thumping bass line and grinding guitar riffs. With it's memorable melody and ZZ Top like feel, this track is hot! Deja Blue has a cool tandem vocal/lead guitar melody with accordion keys giving it a cajun feel. Single note bass line and steady drum lines gives the track a simple structure accenting Suhler's easy slung lead slide work. Very nice. Texassippi has a real nice southern country feel with really supple vocals and acoustic slide work. Sunday Drunk is a great rocker with a relentless bass line. Suhler stretches his strings quite nicely giving the track real bite. Devil In Me opens with a cool drum solo from Chadwell joined by Suhler on slide. Heavy toms and solid bottom is the key to this track with it's slight country taste. Suhler really lets it loose on this one with some slick slide riffs. Excellent! Panther Burn is a heavy lumbering track ... kind of a southern version of Levee Breaks. Alexander and Suhler on vocal with Suhler's slide work and solid drums really gives this track oomph. Scattergun is a really cool shuffle with lead slide. A pure blues number with boss bass lines, this track is great. Suhler and Phares really air it out here for one of the best tracks on the release. Po' Lightnin' has a cool funky beat and with nice lead bass lines and almost spoken lyrics. Prayin' For Rain, built over arpeggios on a theme, is a really sweet ballad. Wrapping the release is Restless Soul, a pure rockin' boogie. If this doesn't get you moving, nothing will. With plenty of slide work this track morphs into a driving version of Bullfrog blues and raw rowdy sliding blues. Excellent closer! These guys ROCK!!! This was an amazing show-as ALWAYS with Jim Suhler (and band)! Jim is one of the best around. Very humble and extremely talented. He brings it live every time.